U.S. imports of biomass-based diesel, which include biodiesel and renewable diesel, totaled 14.1 million barrels in 2017, a 36% decrease from 2016. 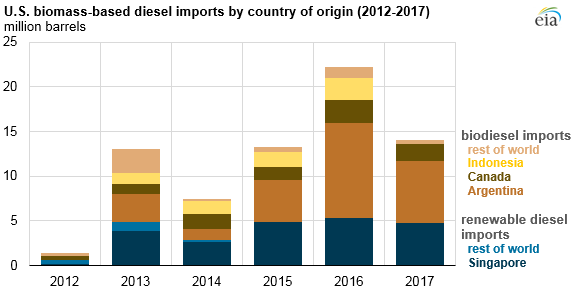 Although increasing Renewable Fuel Standard (RFS) targets have driven increased biomass-based diesel demand in recent years, imports fell in 2017 largely because of U.S. Department of Commerce (DOC) import duties imposed on foreign biodiesel volumes sourced from Argentina and Indonesia, two of the leading exporters of biodiesel. Biodiesel is a mixture of alkyl esters and is often combined with petroleum diesel in blends of 5% to 20% and branded as B5 to B20. By contrast, renewable diesel is composed of hydrocarbon chains that are indistinguishable from petroleum, meaning that it meets specifications for use in existing infrastructure and diesel engines and that it is not subject to any blending limitations. Both fuels are produced from a variety of fats, oils, and grease, collectively referred to as FOGs. Because biomass-based diesel costs more than petroleum diesel to produce, consumption of biomass-based diesel is largely driven by federal and state policies. At the federal level, biomass-based diesel qualifies as an advanced biofuel under the Environmental Protection Agency’s Renewable Fuel Standards program, which mandates the blending of renewable fuels into the nation’s fuel supply. Biomass-based diesel also generates credits under California’s Low Carbon Fuel Standard (LCFS), a cap-and-trade system intended to reduce the carbon intensity of transportation fuels. Because biomass-based diesel has relatively high energy content and low carbon intensity relative to other biofuels used to meet RFS and LCFS targets, its use has increased as RFS and LCFS targets have become more stringent. The United States has been a net importer of biomass-based diesel since 2013. New U.S. contracts for biodiesel from Argentina slowed upon announcement of DOC anti-dumping and countervailing investigations in March 2017. Indonesia did not export any biodiesel to the United States during 2017, possibly because of a preference for Argentine biodiesel. Overall, U.S. imports of biodiesel totaled 9.3 million barrels in 2017, a 44% decrease from 2016 levels. U.S. biodiesel imports from Argentina represented 20% of domestic biodiesel consumption in 2016, which fell to 15% of consumption during 2017 largely as a result of the DOC investigations. Sizeable volumes of biodiesel imports from Argentina or Indonesia are unlikely in the short term without either an increase in the spot price of domestic biodiesel to offset the duties or a settlement among these two countries and the U.S. government. U.S. exports of biodiesel totaled 2.2 million barrels in 2017, about the same level as during the previous three years. Canada has historically imported biodiesel from the Midwest region where most of the production capacity exists. The trade balance between the United States and Canada is about the same level, influenced chiefly by geographic proximity. Renewable diesel imports were 4.7 million barrels in 2017, 12% lower than in 2016. Renewable diesel has been sourced exclusively from Singapore since 2015, and all cargoes have been destined for California, most likely for compliance with the LCFS. Renewable diesel has one of lowest carbon intensities of the approved pathways for LCFS compliance. EIA does not currently publish data on renewable diesel exports. In its latest Short-Term Energy Outlook (STEO), EIA expects the continuation of import duties will lead to reductions in biomass-based diesel imports through 2019. Net imports of biomass-based diesel are forecast to be about 500 million gallons (11.9 million barrels) in both 2018 and 2019.